Known locally as “aguas termales,” the waters are naturally heated by volcanic activity. Most of the hot springs have a great view of the Arenal volcano from the pools. If you’re ever in the Arenal region of Costa Rica there is one activity you have to make time for: a dip in one of the natural hot springs. Known locally as “aguas termales,” the 90 to 110 degree Fahrenheit waters are naturally heated by volcanic activity. In fact, most of the hot springs have a great view of the Arenal volcano from the pools. Imagine relaxing in a lushly landscaped pool in the early evening, steam rising off the water, with tropical drink in hand. 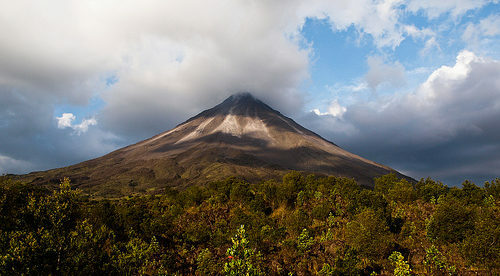 And you have the perfect view with the cone-shaped volcano looming above you. There aren’t many places in the world you can do that. This area about three hours outside the capital, San José, has about a dozen different hot springs you can visit, ranging from deluxe locations with attached spas (most feature volcano mud treatments) to more budget facilities favored by locals. Many line the road heading west out of the tourist town of La Fortuna towards Lake Arenal. On the high end there is Tabacon Hot Springs Resort. Entrance fees are $60 per person. This was one of the first aguas termales in the area. The dozens or so pools of varying temperatures are carved out of black rock and set among tropical gardens. If you’re looking to splurge try this one out. Another higher end option is The Springs. Set in a five-start resort, you can get into this hot spring with a day pass. In fact, they’re usually running a deal that gives you a two-day pass for just $40. One place to avoid is Baldi Hot Springs. It’s popular with tour groups, we’re talking multiple bus loads per day. And it can be crowded inside. Wherever you choose to visit, I recommend heading in just before sunset. As the air temperature cools down… you enjoy the warm waters even more.